If you have been following me on Instagram, you know that a few weeks ago I did something out of the ordinary, I skipped out on my weekday chores and headed out of town to visit a sewing friend for the day. That’s right, I totally played hooky and it felt so good!! 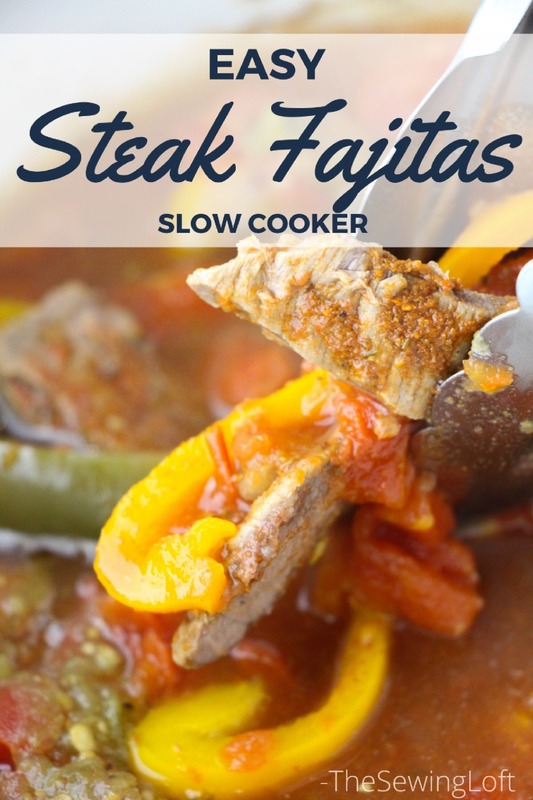 Now granted I was able to toss my Slow Cooker Steak Fajitas recipe into the pot before leaving which meant dinner was all set. Fast forward to the following week and I did it again. Only instead of heading out of dodge, I spent the day sewing and it was heaven! Having dinner options like this allow me to sew up a storm guilt free no matter what day of the week it is. So, I thought that maybe you would like a few new recipes to add to your line up and we could sew together. 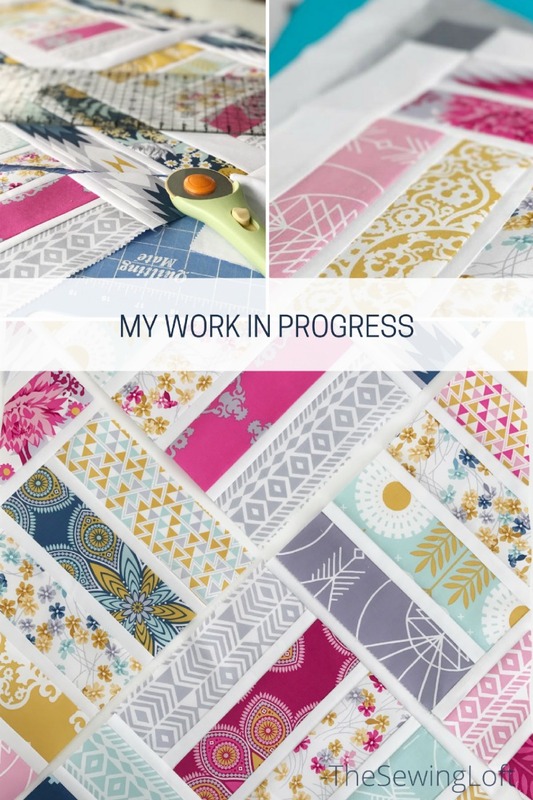 I’ll do my best to share a new slow cooker recipe each month along with a few project sneak peeks on my cutting table and we can stitch the day away without a care in the world. 1. Pour half of the canned tomatoes into the bottom of a slow cooker and spread into an even layer. 2. Top with garlic, half of the peppers and half of the onions, then half of the green chiles. 3. 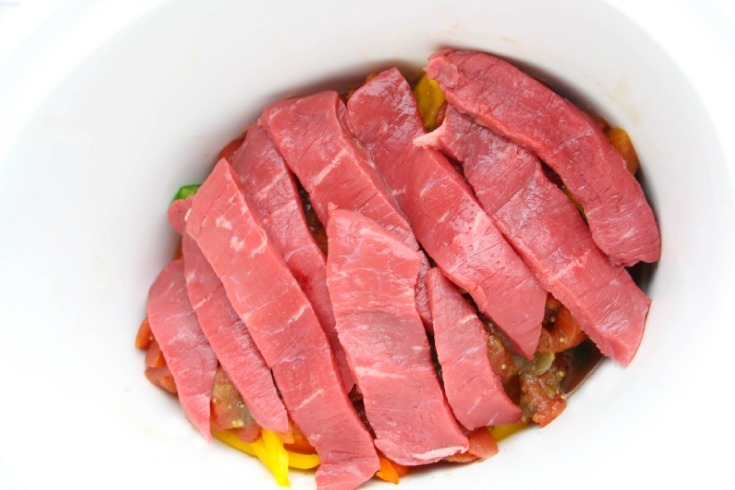 Spread out the beef slices in an even layer, then season with your spices. 4. 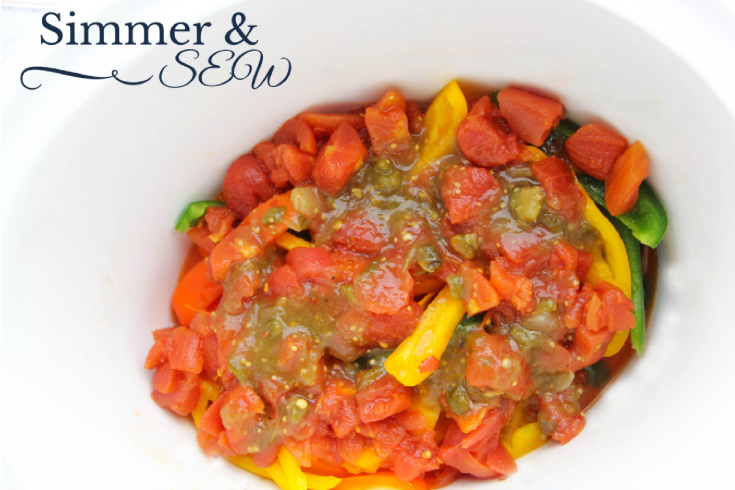 Top with remaining tomatoes, then peppers, onions and green chiles. Cover and cook on high heat 3-4 hours OR low heat 6-8 hours. 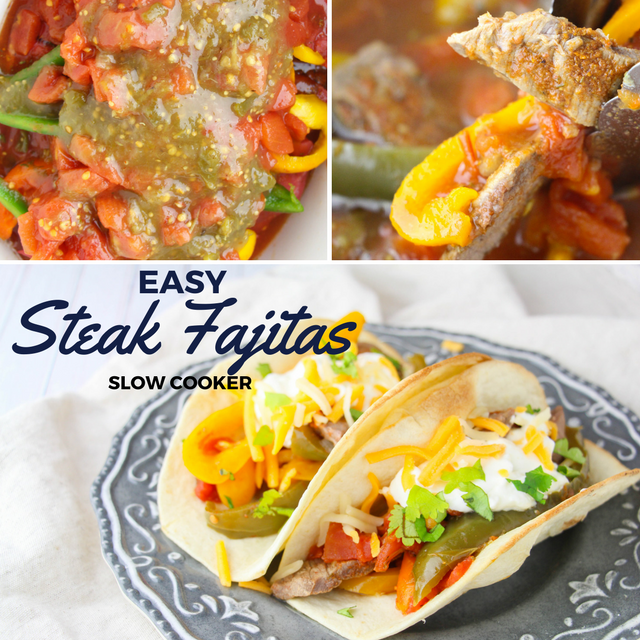 This slow cooker steak fajitas recipe is really a set it and forget it type deal. 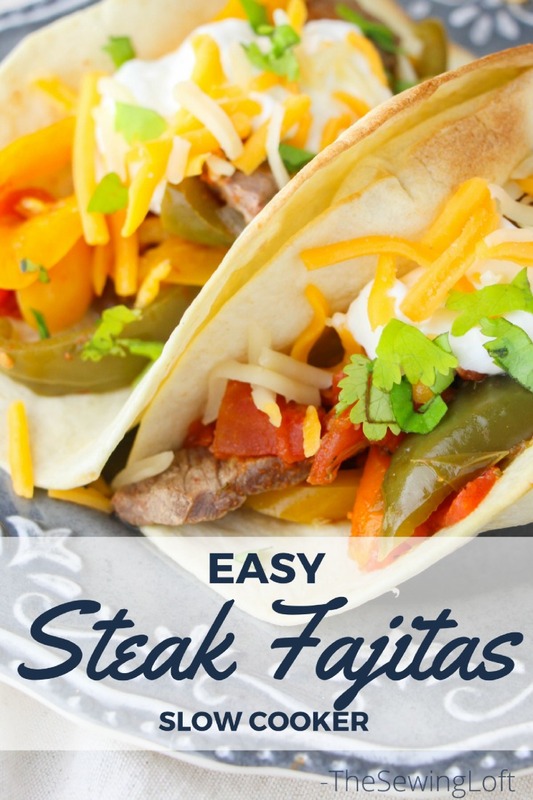 Simply give it a gentle toss, spoon over a warm tortilla and add your favorite garnish for the perfect meal! Using my Crock-Pot allows me to carve out guilt free sew time, that’s why I like to call it simmer & sew! In the end, I was able to finish my quilt and I am keeping my fingers crossed that I can share the new pattern Sugar Bloom with you soon. 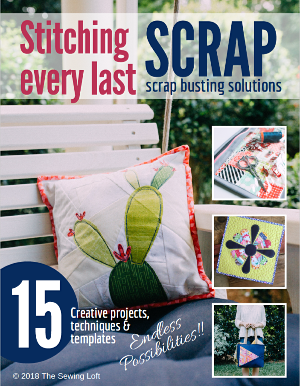 Keep your eyes peeled and your slow cookers handy becuase it will be a sew along! What is the name of the pattern you are working on? I love it! Thanks so much Suzanne. It is Sugar Bloom and I will release it next month on the blog. 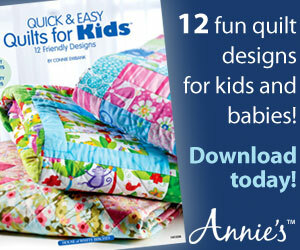 Stay tuned becuase it will be a sew along for anyone to join in.